Barefoot Angie Bee: Welcome 2011 with a Running Chics Giveaway! Welcome 2011 with a Running Chics Giveaway! To celebrate the new year I get to give away an outfit to one of you from Running Chics apparel! I posted a review of my knit thermal and pants here. I am wearing my thermal now as I type this and wore my pants to run in today on my 12 miler. The pants layer easily and I wear a pair of tights underneath them when its particularly cold. 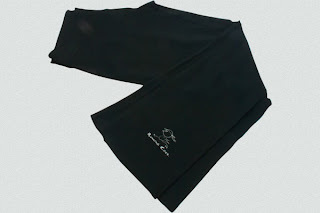 Both the thermal and pants wash well and look brand new after much use and washing. I would love to have multiple thermals in different colors and more pants so I can rotate and always have one on when one is in the wash! Another thing I really like about Running Chics is that there are many chics to choose from such as, Cheer, Swim, Cycling, Tennis, and many more so there is a chic for every chic! Now you have a chance to win a sweet running outfit! Since this is a giveaway for both pants and a thermal it will be very link heavy and many options to choose from to enter. go to their website and shop around and let me know what you like the best. which chic are you?? (if you are trying to win for someone else, what chic do you think they are? Go say hello on their facebook page and tell them that I sent ya over! This giveaway will run until Monday January 11th and I will announce the winner on the 12th! Because I am freezing right now, the jacket looks pretty good! I am a running chic! I said hello on their fb page. And, I love Running Chics - already a facebook fan. I love the jacket - warm and cozy. It would be great almost all year round. I love, love the tanks; I have one that I love to wear year-round (cool in the summer, warms the core in the winter). I'm a pretty straight-forward chic - just a ponytail flying through the air. I'm already a Facebook fan of Running Chics and they post the best quotes...always motivating! 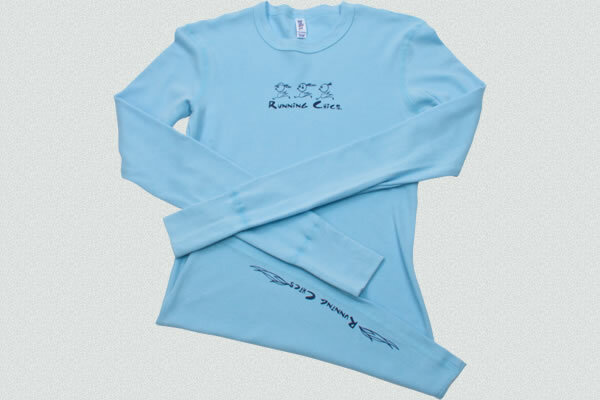 I would pick the Stretch bamboo long sleeve shirt in the Running Chics 3 logo for my sister. I wish they had a Running Mama Chic logo because she would love that one! And linking on my FB page. I think that covers it; I really, really want to win! Thanks for hosting. I would be a running with the doggy chic! Easy! I like the fit of all their tops...long torso, feminine fit! Left a coment on FB that Angie Bee sent me! I'm totally the chic bookin' it in the ball cap and the 'tail floatin' in the wind! I told 'em "Hello" on FB and that you sent me over there. I really like the long running pants - I'm almost as tall as you and struggle to find long enough pants. I posted on their wall that you sent me over! I actually like their vest because I am looking for something to wear to and from the gym. I want to continue being the marathon chic! Right now, I'm a marathon running chic. My running buddy and I start training for our first full today. I like a lot of stuff, but I think the Running chic headbands will make the biggest impression on my friends. I'm a tri-chic. So I guess I need a piece of each, swimming chic, cycling chic, and running chic. I follow you and liked them on facebook! I posted on their wall that you sent me! I love the products and really enjoy the tennis chic! I like Running Chics on FB! I love their thermals....so cozy and still great to workout in! saying hello on FB now! I would get the mesh back tank, since my shoulders are large for my frame (based on many years of competitive swimming), the sleeveless always works better! I am a SWIM chic (that is trying to learn to run)!! I really like the looks of their thermal line. I like the jacket and the vest. I am a running chic. Linked in on my blog's sidebar. Wrote on their FB wall telling them you sent me. My favorite item from the line is the Performance Hoodie. I like the thermals..big time.. I couldn't bring myself to click the "like" button because I was sad that they had excluded plus-sized running "chics" from all the running fashion fun. I like the half marathon running shirt! posted on running chics wall! I love the burnout tees, i have so much workout gear, its fun to have something cute that shows what i love and can wear everyday. Mmmmmm thermal! I'm a follower! When I am not a lazy chic I'm definitely a running chic! I already like Running Chics on FB! I love, love, love their alo hoodie! Since I didn't get one for Xmas, I'll probably be stopping over to buy one soon! I am a running chic and a half marathon running chic!! I follow running chicks on fb! I love the tank or the long sleeve top. Both are super cute! Like Running Chics on FB! I am currently a pregnant chic who is taking a hiatus from running due to exercise restriction by my doctor! I am a prego chick! I liked Running Chics on FB. I'm a marathon running chic! Posted a link to my fb page. Said hello on their fb page! I want to be a marathon running chic. They need a mommy chic with little chics running behind her! I'm a running chic AND a yoga chic. I like the ALO hoodie, the alternative burnout yoga crew tee, and the stretch flex crop pants. Also told them you sent me. I like Running Chics on Facebook. I like the Running Chic with headphones. I posted on their Facebook page that you sent me. I would LOVE to have one of their green alo Hoodies. I am a half-marathon chic....but would like to be a marathon chic. I like the Hoodie in Pacific Blue. I said Hi on their facebook page. I also just posted this on my blog!